NC Growing Together (NCGT) and the NC Small Business Center Network are partnering to develop a monthly webinar series targeted towards small business counselors and other professionals who work with food and farm business development around the state. The webinars will continue through November 2018 and are designed for business counselors, N.C. Cooperative Extension agents, and the staff of other supportive agencies to learn more about the specific business needs of food and farm businesses. What are the opportunities and challenges in this market? What is the ‘transitional organic’ certification? The Carolina Farm Stewardship Association (CFSA) has a dynamic organic production education program. 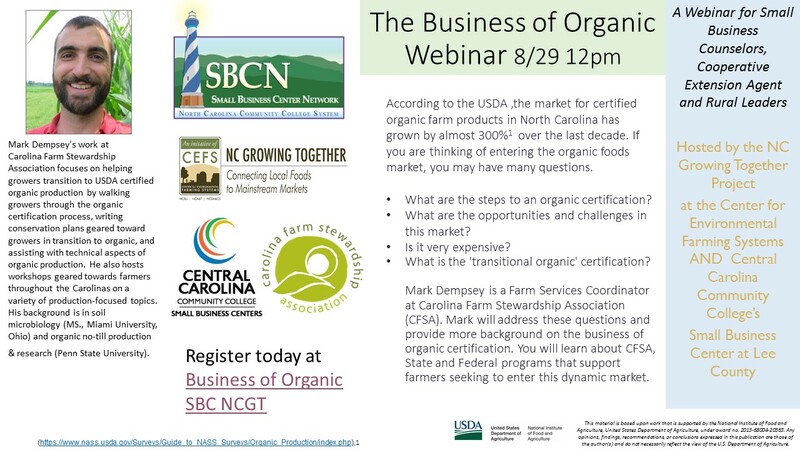 Mark Dempsey is one of two Farm Services Coordinators at CFSA, and he’ll lead the webinar on the business of organic certification. You will learn about CFSA, State and Federal programs that support farmers seeking to enter this dynamic market. Thank you to the Central Carolina Community College Small Business Center for hosting these webinars! NC Growing Together, an initiative of the Center for Environmental Farming Systems, is a six-year, USDA-funded initiative to bring more locally-grown foods into mainstream retail and food service supply chains, strengthening the economics of small to mid-sized farm and fishing operations. For more information about NCGT, please visit the NC Growing Together website.